Kamala Aydazada, BDS: Kamala Aydazada BDS Joined Storeboard! 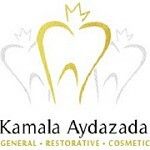 With over twelve years' experience in preventive, restorative and cosmetic dentistry, Dr. Kamala Aydazada is uniquely qualified to both maintain oral health and solve virtually any smile dilemma. A self-proclaimed perfectionist, her work speaks for itself, and she isn't ever truly finished until you are happy and smiling. Working with a team of expert specialists, Dr. Aydazada provides every treatment available, eliminating any referrals and offering true one-stop convenience.